ATLANTIC CITY, N.J. (AP) — Democrat Phil Murphy campaigned for governor of New Jersey in part on a promise to end the state takeover of Atlantic City, the cash-strapped seaside gambling resort whose assets and major decision-making power were seized by his Republican predecessor, Chris Christie. But after nearly nine months in office, Murphy is leaving the takeover in place, possibly for as long as the next three years — the entire term Christie intended. Murphy’s administration released a plan for helping Atlantic City get back on its feet that involved numerous study groups, task forces and committees, as well as a redirection of some state government funds to youth programs, and a training program for municipal department heads. But what the plan does not do is end the takeover, which Christie and the state Legislature put in place in Nov. 2016, determining the city either could not or would not make the painful choices necessary to get its fiscal house in order. The report recommends keeping the takeover in place for the full five years called for under the 2016 law, unless drastic financial improvement happens before then, including the significant reduction or total elimination of the city’s reliance on state aid. “We had a pretty clear-eyed sense of what the challenge was,” Murphy said at a press conference in a school library during which he repeatedly referred to the takeover as a “partnership.” He said he resented the “big-footing” of Atlantic City that was done under Christie’s administration. The takeover law gave the state broad powers, including the right to overturn decisions of the city council, override or even abolish city agencies and seize and sell assets, including the city’s much-coveted water utility. The state overseers could also hire or fire workers, break union contracts, and restructure the city’s debt, most of which was done to varying degrees, although no major assets were sold off. Mayor Frank Gilliam, a fellow Democrat, said it has been difficult serving under the takeover, but he said Murphy’s administration has been willing to listen to concerns and work with city officials, even while retaining ultimate power. 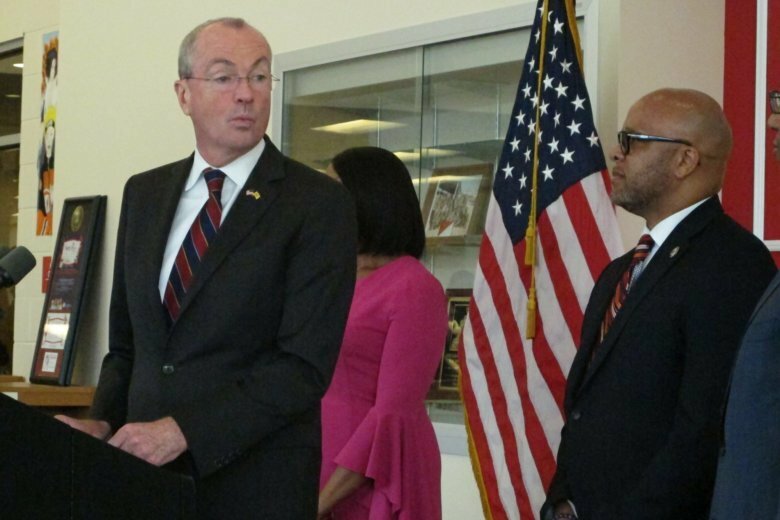 The plan was put together by Jim Johnson, a fellow Democrat who unsuccessfully challenged Murphy for the gubernatorial nomination. It calls for the Casino Reinvestment Development Authority to redirect some of its redevelopment money to programs for Atlantic City’s 10,000 children, more than a third of whom live in poverty. The city’s finances cratered in recent years as five of the city’s 12 casinos shut down, shedding 11,000 jobs and millions of dollars in tax revenue. Two of those five casinos reopened this summer.